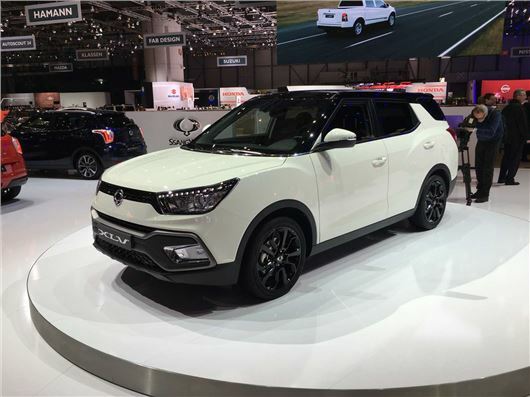 SsangYong has extended the Tivoli range with a new XLV model. The XLV features a lengthened body of 238mm over the standard car, expanding boot capacity to 720 litres. The new model was showcased at the Geneva Motor Show and will arrive in the spring. There's no details about pricing yet, but the Tivoli XLV is expected to command a £1000 premium over the standard £13,000 Tivoli and be offered with the same powertrains, with the choice of a 1.6-litre petrol or diesel engines. As with the normal sized Tivoli, this will be matched to a six-speed manual gearbox as standard, although a six-speed auto will be available as an optional extra. Buyers also get the choice of two or four-wheel drive. SsangYong's decision to - quite literally - extend the Tivoli's appeal is largly down to its huge popularity. The small SUV has only been on sale for 12 months, but has already established itself as SsangYong's most successful new car and about 64,000 cars were manufactured and sold around the world in 2015.